Logging in to Sitemagic CMS can be done in two ways. Either click the Log in link in the upper right cornor of the website, or add /admin to the address of your website. Assuming your website's address is my-website.com, then browse to my-website.com/admin. 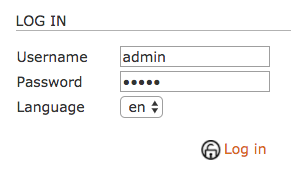 The default username is admin, and the default password is admin as well. Make sure you change the password immediately after log in!